Gearing up for the Guided Inquiry Design Institute is always a time of exciting inspiration for me. Each time, I think about the audience, consider the perspectives and as I go over my slides I reflect on what is to come. This institute is such a joy for me to lead because not only does it give me a chance to share the power of the process with teams of teachers and librarians and to some who have never heard about the ISP or GID before. But not only that, the teams get to experience it. And out of three days they learn so much. They learn about the process as they themselves engage within it, for designing a unit of study is an inquiry of its own. They learn about themselves as a teacher, and as a learner. They learn strategies for effective instruction and have time to collaborate DEEPLY with their colleagues and teammates. It’s an intensive both ‘oh so worth it’ three days. This school year I have had the wonderful pleasure to work with Norman Public Schools. (Have you noticed how many from Norman have contributed to this blog? Well this is why…) They have partnered with me to provide the full 3 day GID institute for over 100 educators district wide. 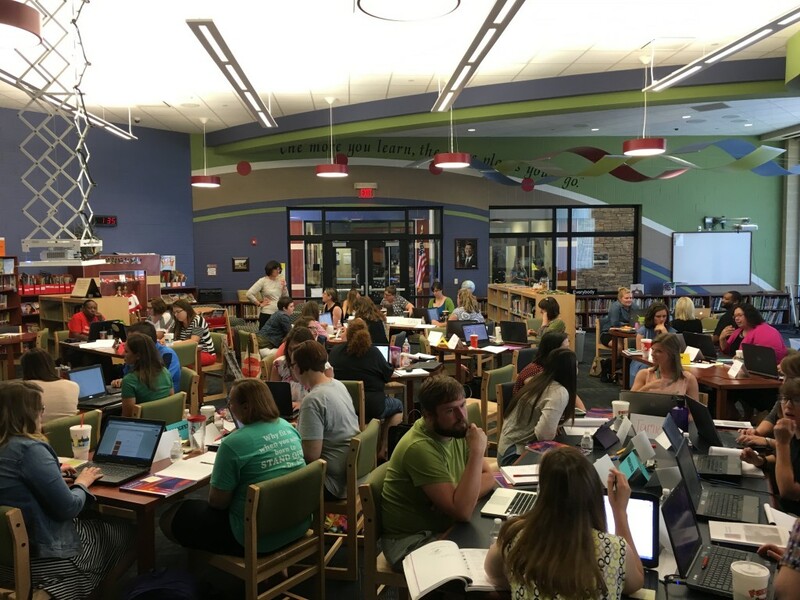 Each school has sent a team and now we are working on getting more teachers onboard with two more summer institutes and another coming up this fall. I am more than thrilled because of my passion for this work, sharing this process empowers educators to use a learning centered approach that gives them the process, and flexibility to teach “the way they’ve always wanted to teach.” This week I have the privilege of working in this brand new school, with over 45 educators to design 20 units of study from Kindergarten to 12th grade in every content area, math, science, social studies, language arts and literature. It’s been amazing. We are on day 2 and tomorrow is the final day of sharing, revising and reflection. Things are HOPPING in Norman.